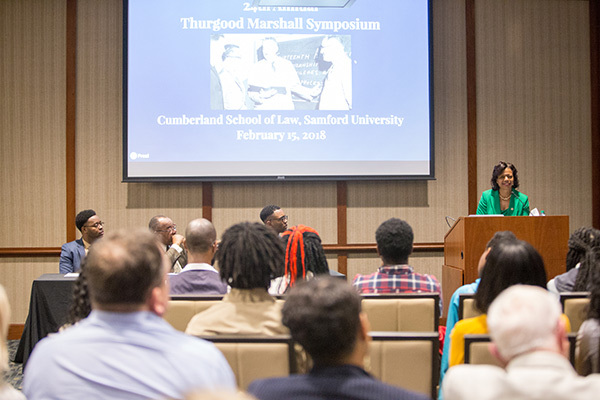 Samford University’s Office of Diversity and Intercultural Initiatives and Cumberland School of Law’s Black Law Students Association presented the 24th annual Thurgood Marshall Symposium recently. Cheri L. Beasley, associate justice for the North Carolina State Supreme Court, delivered the symposium’s keynote message. Introduced by law school friend and Cumberland Assistant Dean Cassandra W. Adams, Beasley began with notes of her own research about Samford’s first African American graduate, Audrey Lattimore Gaston Howard. “When I first heard of the anniversary, I was shocked. Think about it...50 years is really not that long ago,” said event chair Denzel Okinedo. “Audrey Gaston Howard was not only the first African American at the university, but she was also one of two females at the law school. She was a true trailblazer in every sense of the word. Her bravery and resilience paved the way for someone like me, an African-American male, to walk the halls of the law school with confidence in my identity, abilities and future goals. The symposium closed with a presentation to Beasley by the Cumberland Black Law Students Association President Rodney Patrick followed by closing remarks by Dean Henry C. Strickland.